It strikes me that this is a metaphor for life. Getting the balance right is all about having enough to be comfortable but not so much that you drown in possessions and forget what the journey is all about. Because this is a long trip with no practical way of going home and picking up stuff we’d forgotten or wished we’d brought, we decided to buy a trailer and put in it the things we felt sure we would miss if we didn’t bring them. We’ve got a large underbed storage area in the van but it’s not big enough for everything we wanted to bring, so the trailer seemed like a good idea at the time. We have this dream of playing golf as we go round the North Coast of Scotland so we needed our clubs and, as we had a trailer, we decided to bring our trolleys as well. We definitely wanted our wet suits – who would swim in the North of Scotland without one? – but despite their squashy consistency, those babies take up a fair chunk of space. Then we needed to bring our wellies, walking boots, badminton racquets and walking poles. The list grew and grew. Once we’d bought our first trailer (note the use of the word ‘first’) we realised that it wasn’t big enough because we had to get our bikes in there as well. Normally we carry our bikes on a tow ball bike carrier and of course we couldn’t put both the carrier and the trailer on the same tow ball. Trailer number one was returned to Martin the trailer man who laughed and said nearly everyone does that. 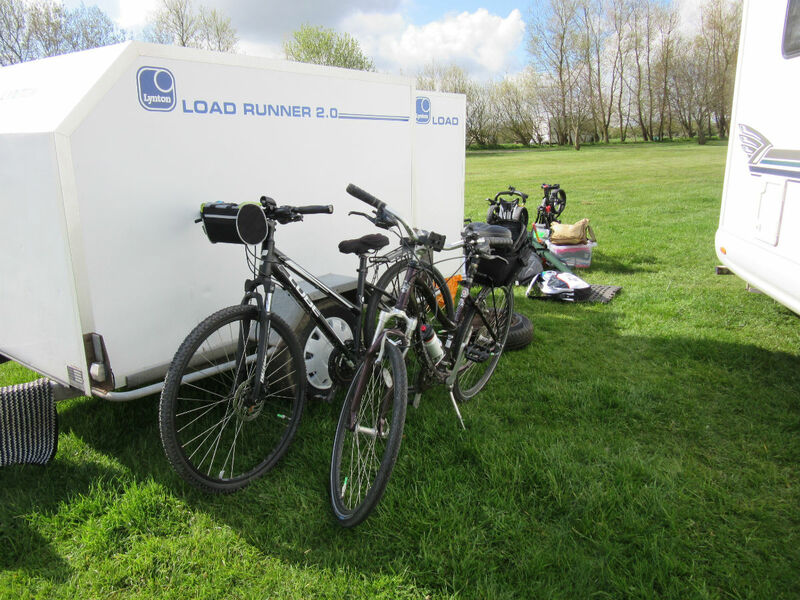 We then chose a second larger trailer and filled it to the gunwales. It all came out … it must fit! Here is the news. We’re sick to the back teeth of the trailer and all the stuff we’ve dragged around for the last six weeks so we’re now planning to cut back what we take with us for the next part of the trip. The trailer itself isn’t a bad idea, because we can use it to store the stuff we don’t want to drag around the narrow roads in the North of Scotland. Fortunately for us, Adrian and Rachel have a driveway and a kind and forgiving disposition. So, it’s time to do a second cull of our belongings. Before we left the house we had an enormous clear out, causing the staff in the local charity shop to cringe when they saw us approaching for the umpteenth time. This time we will be deciding what stays in the van and what goes in the trailer, to be left behind until a later date. Six weeks in the van has given us a reasonable idea of what is important and what just takes up space. The ‘just in case’ mentality will have to be replaced by ‘do I really need that?’. Four outdoor chairs will have to become two and anyone we invite for a cup of tea will have to bring their own. Two folding tables? What was that about? Four pairs of sandals, three pairs of trainers and six fleeces … what were we thinking? I’ll tell you what we were thinking. It was “what if?” … “what if we can’t find a site with washing machines?”, “what if I spill my dinner down my fleece and need another one quickly?” (actually that particular ‘what if’ is more of a ‘when’ – one of us is a messy eater and it isn’t Shirley). So the cull begins today – once it stops snowing. Oh yes we’re back in Scotland. The ‘what ifs’ in life take up too much space and, if we’re not careful, we’ll forget to enjoy the moment while we’re stirring our belongings. This brings me to another challenge of the motorhoming life. Above the cab of our van there is a shelf that has been neatly fitted with places to put small items. The idea is great in principle but the neat spaces are too neat for most of the things we need to store up there. Inevitably the stored stuff finds its way out of the neat places and shuffles around on the shelf, especially when we’re driving over roads that haven’t seen the application of tarmac for quite some time. Something spooky has begun to happen. It doesn’t matter whether Shirley is driving or in the passenger seat, when things drop off the shelf, as they do with monotonous regularity, they always land on her head. Most days there will be a yelp of surprise followed by a few expletives, when a box of tissues or a folded shopping bag lands on her. We’re careful, of course, not to put anything heavy up there but a falling bag of knitting can give you quite a fright if you’re not expecting it. Shirley is not best pleased … and she was even less so when I laughed the last time it happened. I really must keep my sense of the ridiculous under control. Oh help! Shirley, preparing for take off. Poor Shirley ! Although she did make me laugh at her helmet ! It’s not just Shirley. Every time I drive your van something lands on my head too. Never on the passengers’ head though ?? Ha ha! That made me laugh! And Shirley looks fabulous! You are a real tonic after a long day at the office! Thanks.